‘A Guide to Property Values 2012’ by Victoria’s Valuer General was released July 5. It has been comprehensively ignored. The report dissects property transfers and prices lodged with the titles office. This dataset is the actuals, the definitive historical record, and is what scholars of the future will use to examine The Great Australian Land Bubble. Fresher data is more appealing to commentators and the media, who love to point to new emerging trends. This bias has them clustered around factoids like auction clearance rates and endless misleading anecdotes. There are substantial delays between sale date to lodgement to collation. Records are provided to the Valuer General thirty days after settlement, which is typically sixty to ninety days after price is agreed and then aggregated and released quarterly. Five per cent of 2012 sales still remain unrecorded in June 2013. I have condemned this time gap elsewhere. Let us look at what has actually happened. Indeed it did. Median house prices peaked in 2010 ($420,000) and 2011 ($420,000). They have since fallen – yes, fallen – to $412,000 in 2012 and $370,000 in the ‘snapshot’ of the first few weeks of 2013. The Victoria-wide data is blurry and disguises as much as it reveals. The municipal data is clearer, and still statistically valid. I follow Boroondara, Maroondah and Wyndham. Alert readers will know I rent in leafy Balwyn North, a 4 bed 2 bath double garage house worth $1.2 million (my estimate) when I moved in 2010. The rent is $600pw, which the owner did not seek to increase on renewal. The owner is making a 2.5pc gross return. Net rental return would be less than half that, say, 1 pc. Balwyn North is part of Boroondara municipality, a very affluent area inhabited by professionals and business owners. Overall education levels are very high and local schools, both private and government, consistently rank among the best in the state. Transport links and community facilities are fully developed and excellent. Median property prices peaked at $1.32 million in 2010. They are now $1.15 million, down $170,000 or 14.7 pc. The 2013 datapoint comprising 111 house sales is statistically valid. Maroondah, on Melbourne’s Outer East is a developed dormitory area. 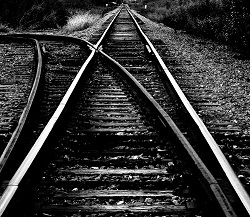 Eastward expansion is constrained by the Urban Growth Boundary. Educational levels are state-average, schools are good, transport is adequate though it is a long commute to the CBD, community facilities are good due to the early foresight of local leaders but now declining. Median prices peaked in 2010 at $510,000. They are now at $470,000, a decline of $40,000 or 8.5 pc. The 2013 datapoint comprising 157 house sales is statistically valid. Wyndham, on Melbourne’s South West is a new, rapidly changing dormitory area adjoining a heavy industry zone and without physical limits to the west and north. Education levels are below average; schools, community facilities and transport links are comprehensively overwhelmed by rapid population growth and are in serious infrastructure deficit. Median prices peaked later, at $359,000 in 2011. They are now at $340,000, down $19,000 or 5.5 pc. The 2013 datapoint comprising 387 house sales is statistically valid. Vacant land, limited in Boroondara and Maroondah, is plentiful and actively offered in Wyndham. Median land prices were $220,000 in 2011 and are now $202,750. This figure probably understates the price movement as developers seeking to maintain margins have likely reduced the size of newly subdivided lots as well as restricting new supply in the face of weak demand. Wyndham land sales volumes peaked at 6,338 in 2009 and were a mere 1,383 in 2012. The Valuer General was kind enough to supply a 25 year price history, which includes the last land price downturn in 1989-91. That downturn was mainly a commercial price retreat. Some juicy highlights of that commercial bust can be found here. 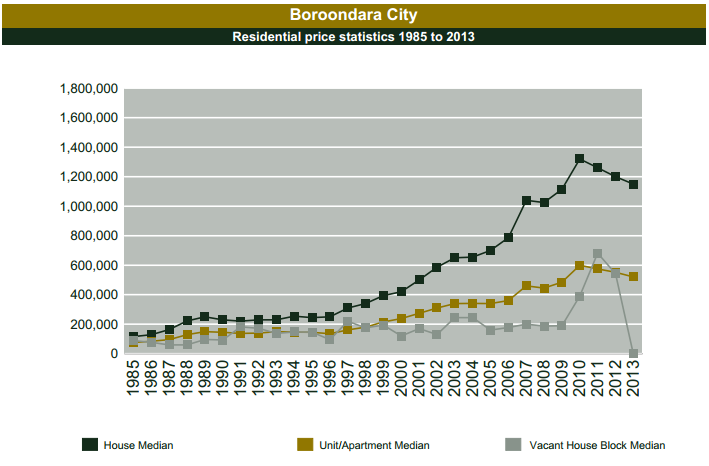 In 1989, Boroondara median house prices were $250,000 and fell 13.1 pc to $221,000 in 1991. 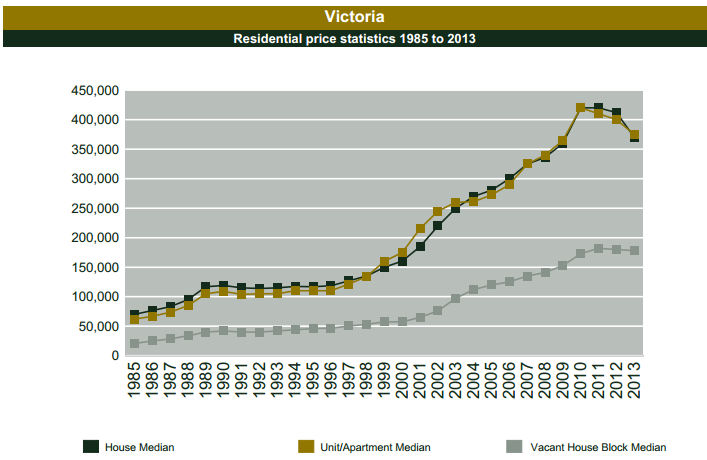 Maroondah had a longer downturn, prices fell 10.9 pc from the 1989 median peak of $132,000 to $119,000 in 1995. 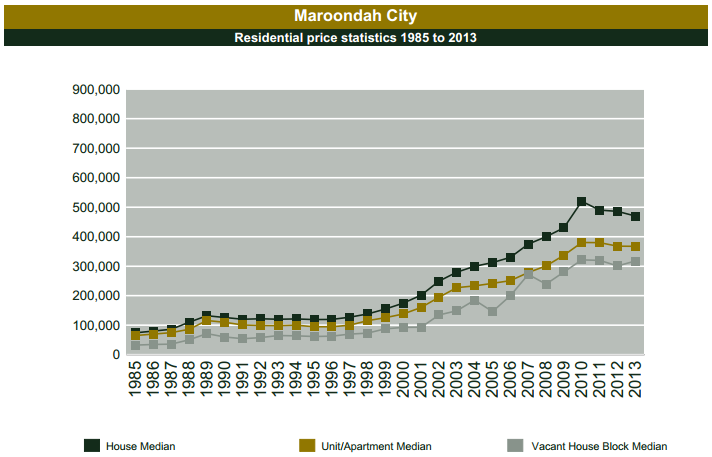 Maroondah next matched the 1989 peak a long nine years later in 1998. 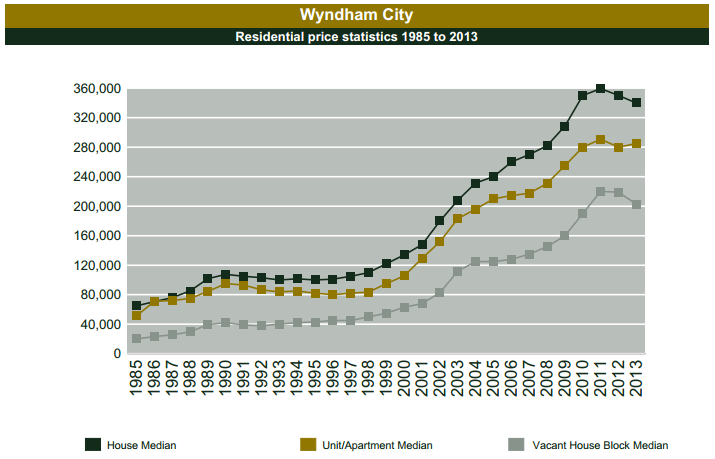 Wyndham house medians topped in 1990 at $107,500 and retreated 7.5 pc to $100,000 in 1995. Inflation and interest rates were much higher then and the real price change – particularly in Maroondah – were more damaging that these bare figures suggest. So, the current price retreat almost exactly matches the 1989-91 experience. Were prices to turn up in the upcoming ‘Spring Selling Season’, landowners, the FIRE sector and government could breathe easy. Amen to the downward trend in house and land prices. Hopefully the coming massive budget deficits will pre-occupy all political parties agendas leaving them with no more silly ideas and no funds to introduce more home grants to raise prices to even more ridiculous levels. It seems the less government interference only makes life easier and better for most Australians. I think you and the team have been great in providing this information. I’ve always found it informative. Would you happen to have datasets for Sydney? The prices in Sydney and what you get (ie, value) compared to Melbourne is quite different. Sydney values are pretty crap. In Sydney – there seems to always be significant housing demand, and it looks like it the only way is up. :( My partner says it’s because most overseas expats want to live here – prices are unlikely to come down in a hurry. Is it just me, but not only am I jaded not only about the negative gearing policy but baby boomers are selling their family homes to downsize to low maintanence places. (eg, apartments) In the meantime, whilst the young couples wanting to start a family and enter into the property market are up against the cashed up baby boomers? What are the likely factors that would continue to contribute to this downward trend?